On occasion, weddings may be scheduled on another weekday if the space is available. The Cathedral/Chapel are NOT available for weddings on the following days: Sundays, Christmas Eve, Holy Days of Obligation, during Lent or the Paschal Triduum, or other designated days. The fee for a wedding at St. John's is $750 paid in two installments: $375 non-refundable down payment to reserve the wedding date and $375 due two months before the wedding date. This fee covers the basic Wedding Music Fee with Dr. Ray Morvant. Any extra musician fees will be charged separately. Please note: If you cancel your wedding for any reason the down payment is non-refundable. Has the bride been married before? Has groom been married before? Please Note: The Cathedral/Chapel are NOT available for weddings on the following days: Sundays, Christmas Eve, Holy Days of Obligation, during Lent or the Paschal Triduum, or other designated days. The total fee for use of the Cathedral is $750. A minimum non-refundable payment of $375 is necessary to reserve the requested date on the calendar. The balance of $375 is expected two months prior to the wedding date. 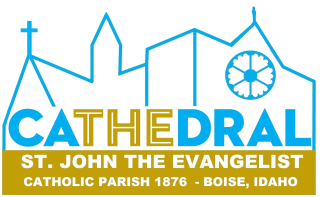 Once the down payment is received a date will be scheduled for the first meeting to discuss Cathedral details and assign clergy. I understand a non-refundable down payment of $375 is required to reserve my wedding date on the Cathedral Event Calendar. I understand a second payment of $375 is due two months prior to the wedding date.